This book is aimed at intellectually-minded people (students and others) who want to develop their intellectual potential, enhance their intellectual awareness and so be better able to participate in one of the greatest quests of all - the quest for freedom. From the Magna Carta to The Matrix, this book is designed to give young intellectuals a firm foundation in the language, stories, characters and ideas of freedom. Warning/Disclaimer: This book shouldn't offend anyone - but, with so many ridiculously over-sensitive people around these days, there's always a danger that it will. Furthermore, please note that this book is intended to present ideas rather than facts. It has often been the job of intellectuals to inspire people to value and protect their freedoms and to fight to regain freedoms that tyrannical governments and oppressive societies have taken away. Most of my books are part of this ongoing fight for freedom. I encourage people to regain their intellectual freedoms through questioning the accepted ideas of the society they live in. There is, however, a problem. Our societies and our education systems are failing to prepare young people to be able to understand intellectual ideas and participate in intellectual conversations, even on such important issues as our fundamental freedoms. If I point to a news story and say, "That's rather Orwellian!" or, "What is this? 1984?" many school leavers will have no idea what I'm referring to. They're lacking in knowledge of key reference points that are used to convey important ideas. It is no wonder their brains turn to mush when they don't have the means to take part in an intellectual conversation. Young people are leaving school without the basic sets of tools and basic awareness to be able to participate in the sorts of normal intellectual conversations that reasonably educated people might well have. They're just not familiar with the basic common reference points within which intellectual discussions can take place. This book is intended for young adults and anyone else who would like to rectify this problem. It is for people who would like to enhance their intellectual awareness and be better able to participate in the ongoing quest for freedom. 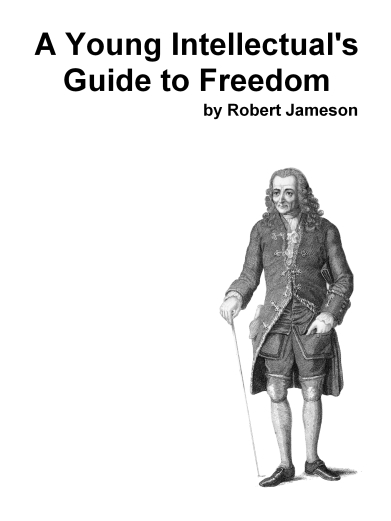 From the Magna Carta to The Matrix, this book is designed to give young intellectuals a firm foundation in the language, stories, characters and ideas of freedom. Robin Hood is a legendary character of English folklore. He is the hero of many stories, songs, plays, books and, in more modern times, films and television series. Most commonly, but not always, he is portrayed as having lived many hundreds of years ago in Sherwood forest, near Nottingham in central England. He is famous for being prodigiously skilled with a bow and arrow and for having a band of followers known as his 'merry men,' most of whom seem to have a particular fondness for the colour green. Little John, Friar Tuck and Will Scarlet are amongst his most well-known companions. He is often also portrayed as being very much in love with the fair Maid Marian. Most importantly of all, however, Robin Hood was an outlaw - he was a criminal, a thief, a robber, a bandit. He lived in the forest in order to escape from the law - and especially from his arch-enemy, the pitiless Sheriff of Nottingham. Was Robin Hood real? Well, there are many references to people known as Robin Hood or 'Robyne Hude' in historical documents. It seems that, at certain times, the name was used as a sort of nickname for any wandering thief. It may be that some of Robin Hood's exploits and adventures were based on those of real people. On the whole, however, the Robin Hood we know of is an invention of popular fiction. It isn't really particularly important whether Robin Hood was real. Sometimes, a legend can be more important than the truth. It's not about the facts - it's about the principles and ideals that the stories represent. What's of enormous cultural importance here, is that, in the Robin Hood stories, the outlaw, the law-breaker, the criminal is the good guy and the authorities are the bad guys. We are used to regarding Robin Hood as a hero, but, in many ways, the legend of Robin Hood is a thoroughly subversive one. In other words, it is one that questions the authority of the state, of officials, of rulers and even of the law. The stories of Robin Hood highlight the fact that legal is not the same as right and that illegal is not the same as wrong. The stories question whether theft is wrong. They question whether it really is wrong to take up arms against the authorities. They question whether law enforcers, courts and judges should be respected and obeyed. Robin Hood is far more than a character in stories where there is a lot of action - chasing about, firing arrows and sword-fighting. The Robin Hood story is a celebration of non-conformism. Robin Hood refuses to conform to the orders from people in authority, he refuses to abide by the rules of society and he refuses to abide by the law. It is a story about freedom - not just the sense of freedom that comes from living in the open, from living with nature in the forest, but the more general freedom of being able to live your life according to your own rules, free from the oppressions of authoritarian masters. The story boldly supports the notion that we should take risks for freedom, that we should fight for freedom and perhaps, if necessary, even lie, steal or kill for freedom. Think about it; we've made a hero out of a villain! Yes, he stole. Yes, he broke the law. He was a bandit, but he's also a hero because, unlike his adversaries, he stood firmly on the side of freedom and justice, even when the law of the land didn't. Robin Hood fought against the rulers and laws of England, but he isn't a villain as far as the people of England are concerned - he's the very essence of Englishness. He's an eccentric, non-conformist. He's a freedom-fighter and a principled, heroic subversive. This fine tradition of subversiveness is something that people and cultures from many parts of the world do not understand. There are many places where you can still be arrested and imprisoned for 'subversion.' There are many places where people are dangerously subservient and deferential to authority and almost anyone in an official uniform. The Robin Hood legend is far more than an adventure story. It is of great cultural importance because it encourages us to celebrate the outsider, the outlaw, the non-conformist, the adventurer and to always question the dictates of those in authority and of the law itself. Despite the continued popularity of Robin Hood, however, I wonder if he's the sort of person we might respect if he's in a fictional story or if he's fighting in some far-off part of the world, but who society often dislikes and derides when he's fighting here at home against our own government. Too often, our fine tradition of subversiveness often goes largely ignored in modern England. Sometimes, we in England have to look to others - some of our friends in the United States, for example - to champion the subversiveness that we used to cherish and nurture, but too often, these days, neglect. It's time we made a renewed effort to reacquaint ourselves with Robin Hood's non-conformist values and his great passion for freedom. John Stuart Mill (1806-1873) was a philosopher and he and his ideas are intimately associated with the cause of freedom. His most famous work was, 'On Liberty,' and the view he most famously supported and promoted was basically that the state, the government and their representatives - the police and other officials, for example - should no way in hell just have the right to tell you, as an individual, what you can and can't do unless they have a very, very good reason for doing so. He asked when the government or the state might be justified in restricting your individual liberty. When should it be allowed to tell you you can't do something? When should it be allowed to compromise on your freedoms? The answer he came up with, argued for and promoted was essentially very simple: The state should only restrict your individual freedoms in order to stop you restricting the freedom of others. So, some simple examples: Mill would argue that the state is perfectly justified in stopping you committing murders because, if you murder someone, that takes away their freedom. Generally, if you physically harm other people, you are taking their freedom away in some way. If you break their legs, this obviously restricts their movement, but any violence or threat of violence can obviously stop people going about the streets and going about their lives as they see fit. The state is also justified in stopping you kidnapping people, because that obviously takes away their freedom too. And if you steal, that obviously takes away someone else's freedom to use their own possessions. The state, therefore, may be able to justify putting you in prison if that's what's necessary to stop you murdering, harming or stealing from other people. On the other hand, the state is not justified in taking your freedom away simply because it doesn't like what you are doing. It also shouldn't stop you saying things just because it doesn't like or doesn't agree with what you are saying. Even if you say racist or sexist things, that doesn't really restrict the freedom of others. They are still free to argue back at you and tell you what they think of your bigoted opinions. The fact that they or the state doesn't like what you are saying is irrelevant. You're not taking away anyone else's freedoms, so the state shouldn't restrict your freedom to speak your mind. In short, Mill argued in defence of individual liberty and against allowing the state to override our individual freedoms, except in the defence of other people's freedoms. In truth, Mill himself was not as firm on the key principles of liberty as perhaps he could have been. He was a 'utilitarian.' In other words, he argued on the basis that society would be better off if his libertarian principles were followed. This is different from arguing on the basis that liberty is or should be a fundamental human right. Nevertheless, his work has been hugely influential in underpinning our ideas of fundamental human rights based upon a recognition that freedom matters. Liberty is at the heart of what makes us alive and is the foundation of so much of what makes life worth living. This book is available as a paperback from Amazon.co.uk, Amazon.com and various other Amazon sites around the world. And now, thanks to support we received via Patreon, you can download a copy for FREE from Apple's iBookstore, from the Kobo and Nook stores, or from Google Play Books. Thanks Patrons! To help keep this book free, please consider making a donation via Patreon yourself, if you can!